A vacuum tube is mounted on the final stage. A high-grade driver dedicated to the stax headphone that adopted balance method amplification. Frequency response DC 100 kHz / + 0, -3 dB When using one SR-007. Rated input level 200 mV / 100 V output. Maximum input level 30 V r.
Amplification degree 54 dB (500 times). Harmonic distortion 0.01% or less / 1 kHz When using 100 V r.
/SR- 007 A or SR-404. Input impedance 50 K / 50 K when balanced × 2. Maximum output voltage 340 V r.
Standard bias voltage PRO bias DC 580V. 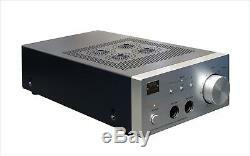 Power supply voltage AC 100 V ± 5%, 50 to 60 Hz (Voltage change can not be changed). Operating temperature range 0 to 35 ° C. External Dimensions (W) 195 x (H) 103 x (D) 420 mm Including VR knob and pin jack (20 + 10). Please let me know if you have any questions. Also, please tell me if you have what you're looking for in Japan items. International Buyers - Please Note. These charges are the buyers responsibility. The item "New STAX vacuum tube driver unit SRM-007tA EMS Free Shipping from JAPAN" is in sale since Monday, November 6, 2017. This item is in the category "Consumer Electronics\Portable Audio & Headphones\Headphone Parts & Accessories".